The Rublev Colours 19th Century Watercolor Palette introduces you to the palette of watercolors typically used by British and American 19th century masters. The colors are based on the palette used by watercolorists in the mid-part of that century. The confluence of amateur activity, publishing markets, middle class art collecting and 19th century painting technique led to the formation of English watercolor painting societies: the Society of Painters in Water Colours (1804, later known as the Royal Watercolour Society), and the New Water Colour Society (1832). (A Scottish Society of Painters in Water Colour was founded in 1878.) These societies provided annual exhibitions and buyer referrals for many artists and also engaged in petty status rivalries and aesthetic debates, particularly between advocates of traditional ("transparent") watercolor and the early adopters of the denser color possible with body color or gouache ("opaque" watercolor). The late Georgian and Victorian periods produced the zenith of the British watercolor, among the most impressive 19th century works on paper, by Joseph Mallord William Turner, John Varley, John Sell Cotman, David Cox, Peter de Wint, William Henry Hunt, John Frederick Lewis, Myles Birket Foster, Frederick Walker, Thomas Collier and many others. In particular, the graceful and atmospheric genre paintings by Richard Parkes Bonington created an international fad for watercolor painting, especially in England and France, in the 1820s. In David Cox’s (1783-1859) 1816 edition of A Series of Progressive Lessons in Water Colours, published by T. Clay, the following palette is suggested: Gamboge, Light Ochre, Light Red, Lake, Vermillion, Burnt Sienna, Vandyke Brown, Prussian Blue, Indigo, Sepia and Black. However, some of these colors, such as Gamboge, Indigo and Sepia are not lightfast and were substituted on the watercolorists' palette by newer pigments introduced in the first half of the century. Hence, a typical 19th century palette may have contained the following colors: Cobalt Blue, Prussian Blue, Chrome Yellow, Raw Sienna, Venetian Red, Rose Madder, and Burnt Umber. Rublev Colours features such genuine watercolors as natural Ultramarine (Lapis Lazuli), Azurite, Malachite, among many others. These single pigment paints available in moist (tubes) and semi-moist (pans) watercolors are made with the same pigments used by masters of past centuries. While the trend today in commercial watercolors is to suppress pigment textures in favor of homogeneous, flat color, the earth and mineral pigments used in Rublev Colours Watercolors feature larger particles that produce granulation effects without the use of surfactants, such as ox gall. 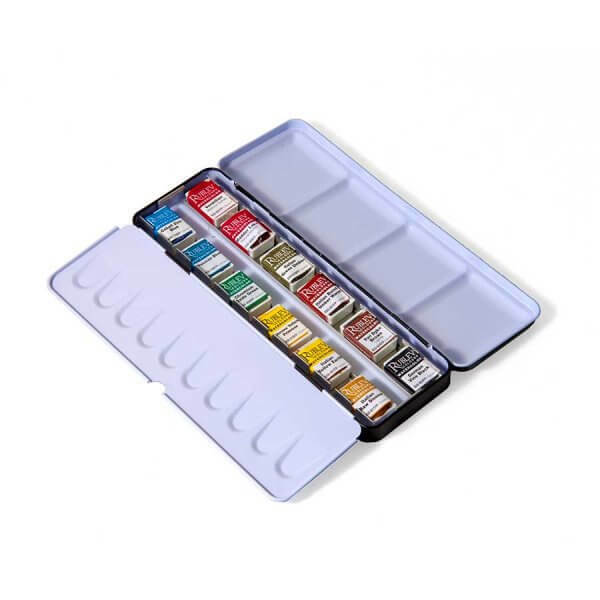 Unlike pan watercolors made by the extrusion process, Rublev Colours Watercolors are poured—a process that preserves the integrity of each color and results in semi-moist cakes that respond instantly to a wet brush. Apply Rublev Colours watercolor on paper or other absorbent surfaces prepared to accept water-borne paint. Clean up is easy with soap and water.